The Combination Gun Motor Carriage M15 is a Rank III American self-propelled anti-aircraft gun with a battle rating of 3.3. It is one of the first American tanks to be released with the American ground tree in Update 1.45 "Steel Generals". Comparing the M15 CGMC to the previous M16 and M13, they first appear similar. The same maneuverability and mobility is still passed on. All feature, Browning heavy machine guns. But at this point the similarities end. Both M13 and M16 have only one weapon system making long range shots easier to hit with all weapons. They also carry plenty of ammo (both 4800 rounds or 12 / 6 reloads) and will fire long after the M15 ran out of 37 mm and 12.7 mm rounds. Of course the Combination Gun Motor Carriage has some advantages to the machine gun only armed versions: A nasty cannon and actual armour, the M15A1 is entrusted with the ability to engage at a longer distance down aircraft faster, and most importantly, survive much longer. However, the price paid is the inability for the armament to cover the vehicle's front and a slower turret rotation. The latter can be addressed by driving backwards while in a combat zone. A noteworthy issue the gun layout: The secondary anti-air weapons (the M2 Brownings) can only be fired with the machine gun key. They do not activate when pressing the secondary weapon key. As being a half truck and tank it will turn well in all speeds compared to other SPAA. The M15 CGMC is a self propelled anti-air vehicle. This machine is a very simple deal: More armour and a cannon in change for less ammo and more difficult aiming. Not much more to say. Stay behind and close to allies, but outside the enemies view-range and with clear line of sight to the horizon for low aircraft, and try to keep the turret facing rear of the vehicle. Open top, open rear and only 12 mm (0.5 inch) all around? SU-152's and M4 (105)'s HE shells will always be happy to obliterate the M15A1. On the other hand those nasty aircraft cannot damage it easily with their machine gun fire and Armour-piercing rounds are usually not fielded by fighters. Something to be aware of though is the 37 mm ammo location: The turret bin's walls. Easy to hit and even easier to detonate by tanks. M59A1 shot AP-T / HEFI-T* These work fine, a hit on an aircraft means certain destruction for it and still is able to hurt some ground vehicles. M54 shell HEFI-T* These are best for against aircraft. M59A1 shot AP-T These are the worst belts against airplanes and even tho they are able to hurt some ground vehicles, loading them in a RB match is usually a mistake. Ammo racks of the M15A1 CGMC. Compared to certain other SPAAs (ZSU-37, Wirbelwind, M13, etc.) 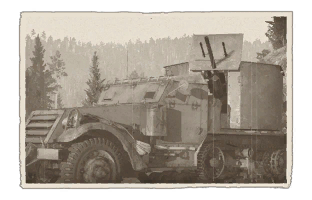 the M15 cannot be used effectively in an anti-vehicle role. The average battle-rating is too high and the penetration value of the AP shells to low. While it does have increased armour compared to earlier models, it is still not strong enough against the devastating tank HE shells. However the armour performs well versus the average aircraft armament. With the 37 mm cannon the CGMC has an good tool versus bombers and armoured attackers. The ammo is limited though. Reserve the fire for certain hits. Against fighters the same tactic should be applied, while now the 12.7 mm HMG should be used as well, their ammo is limited, too. Without firing discipline, the M15A1 ammo will run out very fast. Ingame screenshot of the M15 CGMC on the map Normandy. Unlike many other SPAA this vehicle can continue shooting once it is reloading the big gun (37 mm cannon or the smaller caliber M2 Browning guns). However, continued fire is not the strength of this machine. It simply lacks the ammo for it, 200 shells will earn some scores, but simply cannot compete with the constant rate of fire the German Sd.kfz 6/2 As it has an extremely short reload time. The Axis counter part has less armour overall, yet fire rate is 40 rounds a minute higher (~160 shells/min) and has 318 shots total instead of meager 200. In addition the German SPAA actually has efficient high-velocity rounds with 48 mm @ 100m (1.9 inches at 110 yards). Decent armour, compared to its predecessors. Armour to an extent can soak up 12.7 mm rounds, something the previous vehicles could not do. Guns are fired separately, allowing for shots between reloading guns or tricking the enemy into misidentifying the vehicle as a M13 MGMC. 37 mm can attack other tanks if necessary, though this is not recommended due to low penetration. Low ammo count, will run out easily. Split armament causes different ballistics between them. Different velocities for the cannon and machine guns. Open top turret, so the Turret crew is exposed. Very uneven center of gravity, may tip over in tight turns. 37 mm ammunition is stored in the turret walls, it is easy to hit and is lethal to the crew and tank. Cannot cover the front of the vehicle. The history of the M15 CGMC, or Combination Gun Motor Carriage, vehicle is derived from the prototype T28 CGMC. The T28 prototype was itself developed from the US Army Coast Artillery Corps T1A2 Multiple Gun Motor Carriage project, which was designed around the current Army 37mm M1A2 Autocannon to be flanked with two .50 caliber M2 Browning machine guns on an M2 half-track. This vehicle was designated the T28, but failed evaluations in Aberdeen Proving Grounds due to the heavy recoil, causing the project to be cancelled in 1942. But the US Army Armored Forces required a mobile anti-aircraft system to support their tanks in combat, so the T28 was revitalized with modifications, using the larger M3 half-tracks as the basis instead with a newer sight for target spotting, this modified variant was the T28E1 CGMC, and 81 of these were built from July to August of 1942 by White Motor Company. These vehicles did not have an armoured mount for the crew, leaving the gun and crew exposed to enemy fire, but after initial production, the vehicle was given an armoured shield and this was now designated the M15 CGMC. The M15 CGMC had an M42 armoured weapon mount with two .50 caliber Browning machine guns side by side above the main 37 mm armament in the center. Initial versions produced in 1943 accounted for 680 M15s built before a modification with a lighter gun mount, lighter machine guns, and new sights. The M15s made from the M3A1 half-track chassis and were designated the M15A1 CGMC, which accounted for 1,052 units produced in 1943, and another 600 in 1944. This lead to a total production of 2,332 vehicles produced in the span of 1942 to 1944. The M15 CGMC were first used in Operation Torch as the T28E1, when the Americans and British forces invaded North Africa. Crew usage was for the .50 caliber machine guns to fire tracers to bring the gun up to aim with the intended target. Performance of the M15 CGMC accounted for more than one hundred downed aircraft during the North African and Italian campaigns. During the invasion of Sicily, 78 T28E1s were available to provide anti-air protection for the invading force against the German low-flying planes such as the Stuka dive bombers. The T28E1s were still used all the way until the end of the war despite the development of the more armoured M15 half-tracks. The M15s were organized into anti-aircraft artillery companies in the US Armored Divisions. In one company, there were eight M15 CGMCs and eight M16 MGMCs. At higher levels, such as in the corps and army level, there were 32 of each vehicle available. The M15s accompanied its prototype in the Italian campaign, but also saw use in the Battle of Normandy and Operation Dragoon in France, and the rest of the fighting on the Western Front. Like the M16 MGMC, the M15 CGMC was used as both in an anti-aircraft role and a ground support role, supporting the infantry as they advance into territory where German aircraft prevalence becomes lower and lower. The M15 also served in the Pacific during the Philippines Campaign and the Battle of Okinawa in the same roles in the European theater. During World War II, the M15 CGMCs wre also given out in large numbers to allies, such as the Soviet Union. 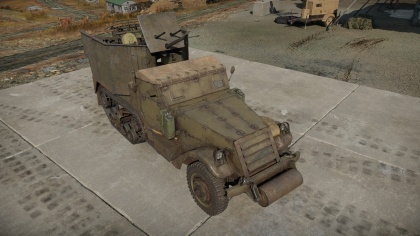 An attempt to upgrade the M15s to enhance firepower in the Korean War was done in Australia by converting the M15 CGMCs by removing the 37 mm and .50 caliber machine gun mount and instead replacing it with a single 40 mm Bofors cannon. This modified M15 was unofficially named the M15 "Special" and was used during the Battle of the Philippines. After World War II, many M15s were given to Japan under the Military Aid Program to support their new military formation. The M15s saw service again in the Korean War as an anti-aircraft and ground support vehicle. However, the M15 was classified as "limited standard" like its M16 counterpart due to its lower efficiency against the newer planes present due to advances in technology. The M15 "Special" was taken up as an improved version of the M15 and adopted due to the larger quantity of 40 mm ammo than the 37 mm, this caused the modified M15s to be designated the T19, then officially as the M34. The M15 was declared obsolete in 1946 and retired some time after that, with the remaining ones given to Japan. Camouflages, skins and paint patterns for the M15 Combination Gun Motor Carriage from live.warthunder.